Affiliate marketing Vs Dropshipping… Two of the most well known models for making money online and they share quite a lot of similarities. More specifically, which one is best for beginners? During this post, I will explain exactly what these two business models involve and the pros vs cons of each. Finally I can conclude which is better…. Or if one is really better at all. What Is Affiliate Marketing/What Is Dropshipping!?! With Affiliate marketing, you promote other peoples products and services on your website, via social media and on your email list. To do this, you need to sign up to affiliate programs and networks, which are free to join. Sometimes you will need to have some content on your website and some traffic coming in, whereas others there is no requirement. Once you’ve joined an affiliate program, you will have a particular affiliate tracking link set up and if people click on YOUR link and make a purchase, you earn a certain amount of commission and that amount of commission you get, will depend on the program. The commission could be 4%… it could be 75%, it entirely depends on the affiliate program you’ve joined. You just drive customers to your affiliate links and that’s as far as it goes. The best affiliate programs to join for beginners. With dropshipping, again you don’t have to hold any inventory – the manufacturer ships products to your customer on your behalf as well. However, in this case you will have an actual online store, which you fill with products. There are thousands of different products and niches you can explore, (Check Aliexpress – a good option for beginners to source products). You drive traffic to your store, using both free and paid methods and you earn a commission on every sale made. I have seen some people claim that you can make a higher profit with dropshipping, but this is entirely dependent on what products you’re selling. You can get some very high paying affiliate programs too, so it’s not that clear cut and there will be many factors involved that determine how much profit you can generate. Including, how much you end up spending on marketing and paid traffic methods! As you can set a low-daily threshold for your Ad, (say, $5) and test products before you scale up Ad campaigns. Affiliate marketing very low cost barrier to entry and therefore, it’s a low risk thing to try out. The only thing you’re really going to risk initially, is your time. Aside from setting up your website, (so buying a domain name and hosting) and actually learning how to do it, there aren’t many costs involved. Many affiliates start out driving traffic via free methods, while they learn the ropes. While this will make progress slow initially, it does make it very low-cost and an opportunity for practically anyone with even a limited income. Alternatively, if you do pay to drive traffic, you should be able to write off this cost as business expense anyway – when it comes to tax time! However, if you do set up a paid traffic campaign to a merchants website and this is highly converting, you can start to create very passive income that does not take much work to maintain. The trouble is, getting to that point. I’ve seen many a beginner marketer lose thousands of dollars trying to create profitable Ad campaigns. Things are a bit different if you’re a blogger using affiliate marketing…. Because often, this will be one of several income streams over time. So, that part is cheap, but income can be unreliable. Yes, you get some bloggers on a full-time income within a year, or even less, but these are in the minority. In any case, another perk of affiliate marketing; is that you don’t have to deal with customer service at all. Once someone clicks through your link and are on the merchants website – it’s totally out of your hands and you don’t have to deal with any customer service issues, complaints, or returns. The only case where you may have to deal with customers, is if someone buys a product after reading your own positive review or recommendation and then may complain about it – but it’s up to the merchant to deal with any complaints, or returns. If you create an affiliate website, or a blog that uses affiliate marketing – you will be creating a piece of internet property that can grow in value over time. As you can see here... A website making around $700 a month in profit, could fetch almost $20,000 if you sold it and the more money a site earns per month, the more that you can sell it for. This is another reason why, you should always start an affiliate marketing business WITH a website at the same time and not try and do it without one. Well, to start with, the products that you try and promote as an affiliate can be hit and miss and your campaigns aren’t always going to be a success. There can be a lot of trial and error involved and you need to find product or services that convert well and are a good fit for your particular audience – which can take time to figure out. If you are using paid traffic and are inexperienced, then you may end up spending a lot of money for nothing if you’re not very careful – so, it’s best to get some good training in that area if it’s something you want to do. If you’re a blogger, who uses affiliate marketing as an income stream and are using free traffic methods – then how many sales you make will likely vary month to month. It will also depend on how much traffic you have coming in, (and if you can increase that traffic, or at least maintain it). Or even check out someone else’s review later and go through THEIR affiliate link instead! The window within which a customer needs to make a purchase after going through your link, also varies. So, the Amazon affiliate program only has a 24 hour cookie. Therefore, if your customer goes via your link, but then doesn’t buy anything for two days, you don’t make a sale. Usually the cookie length is a much longer than this though, like 30 days. I’ve even seen lifetime cookies. It doesn’t matter that they went through yours first, that affiliate will get the sale instead of you. A further downside of affiliate marketing, is that many programs have a payout threshold in place. For example; with Amazon associates, I need to make at least $100 before I can get paid, because I’m in the UK – but then you have to wait for a cheque to arrive and then you have to go through a bit of a drawn out process at the bank to cash it in, because it’s in dollars. I would have thought they’d have found a better way to deal with this by now, but right now they haven’t. (For example; Merch By Amazon pay me directly into my bank account in the UK… so, why have Amazon Associates not sorted that out!?! No idea…). So, say you make $90 with Amazon once month, you’ll have to wait a whole other month before you get paid. But even then, you need to be sent the money in the post and then you need to pay a fee to have it transferred into pounds in your bank account. When you’re a blogger affiliate marketing, you’ll likely be part of many programs online and have lots of mini income streams, this can become difficult to keep track of and sometimes. You’ll can also get stuck, before you reach the payout threshold with some products that you just don’t sell much of! That said, it doesn’t tend to be too much of an issue, as you will usually have your *main,* products that you make enough… It’s just a mild irritant. Last but not least… With affiliate marketing, although you can certainly resell to your customers if you have an email list, a lot of the time you’re going to be getting one-off customers. They will go off and make a purchase via your link and may never again return to your site! This is why it is very important to capture email addresses. But also, when someone makes a purchase via your link, often times they will end up on the companies email list that you just sent them to. Now they will be able to market to your customer again and again and you’re not even in the equation. Just like affiliate marketing, dropshipping also has a low barrier to entry and is fairly low risk to try out. You also get paid no matter how much you make, so there are no payout thresholds to reach or anything like that, usually you’ll be paid on a weekly basis. You can purchase some items at an extremely low cost, (for example; look at the image below! Amazing that you can purchase one of these for less than a dollar!!!). After browsing through AliExpress… you may not see products the same way ever again. One stand I saw in town, had tonnes of different designs at a stall he was running, with hundreds of cards there available and sold for around $4. It was actually on alibaba.com that I saw the original pop-up cards, so he would have been buying in bulk and probably paid more like 50 cents or less per card in reality. Obviously, this person wasn’t dropshipping – but once you start doing this, you spend much more time noticing how much things cost and will find yourself checking Aliexpress or Alibaba online regularly! As Aliexpress allows you to order one item at a time, it’s going to be really cheap to test out a variety of products. You don’t buy a bulk of items that you’re stuck with, which is a great advantage. So, anyway the point is that you can buy lots of items at a very low price and sell for a much higher price point. It’s not unusual that a $1 could sell for $15 or more and this would help pay towards some of the paid advertising costs and any other expenses. Also, you hopefully won’t lose your customers like with affiliate marketing. If you also build an email list, you’ll be able to regularly mail your customers with new products, deals and promotions and you link them directly to your OWN store rather than to someone else’s website. 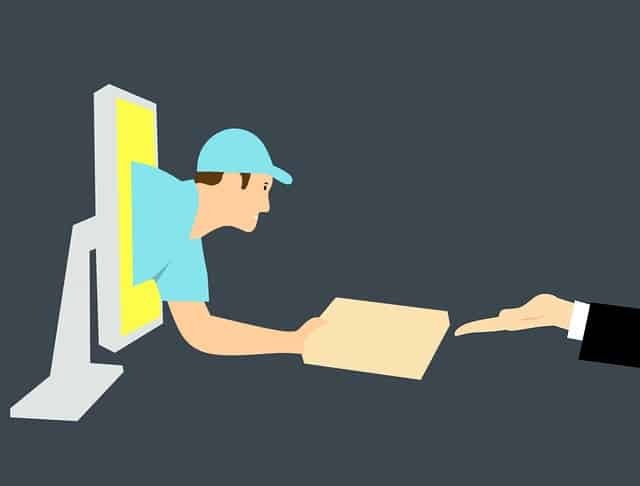 Dropshipping is more hands on – there are tools that can create a certain amount of automation but, (unless you outsource the task) you will STILL have to deal with customer service and support. You would be able to get a freelancer to do customer service for you – somewhere like Upwork, but you’d want to ensure they did a good job and were properly trained. However, by freeing up that time you’d be usually spending replying to customer issues and comments, you could be optimizing your Ad campaigns and marketing efforts. You have to be careful which products and suppliers you work with. Often the products are going to take a long time to be delivered, often it could be weeks and so, you’re likely to get customers asking where their product is, (perhaps they didn’t even realise quite how long it would take!). If the order is delayed, it’s you the customer is going to be complaining to. If you’re driving traffic with something like Facebook Ads, you may have to test out a whole bunch of products before you find one that’s actually profitable. Thankfully, you can test out items on Facebook relatively cheaply and you can figure out quickly if an item is actually going to sell! 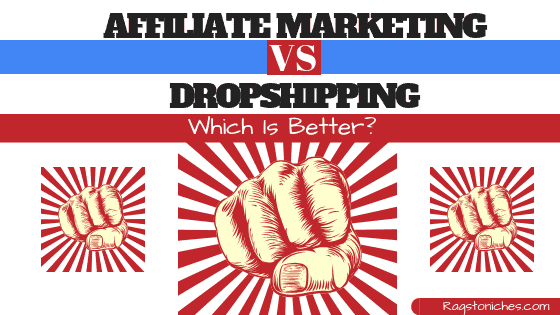 Conclusion: Affiliate Marketing Vs Dropshipping, Which Is Best? Well, you can see for yourself that there are plenty of Pros And Cons to each and actually, I think it would be wrong to place one higher than the other. Both have a low barrier to entry, both can make you a lot of money. Although, in both cases, only with a lot of hard work and sustained effort over time. And this can tend to gloss over quite how difficult it can be to start having success with an online business. If I HAD to choose, I would still say affiliate marketing is best for beginners… Yes, I am biased, because that’s how I started. However, by learning affiliate marketing, you also end up learning a lot of other skills that can be hugely beneficial down the road. How to generate different income streams, (such as via paid Ads, or sponsored content). I mean, yes, you’re going to end up learning some of those skills with dropshipping too, but I don’t think as much! On the other hand, if you do go with dropshipping, you’d more likely gain experience with paid advertising earlier on (such as by using Facebook Ads). While I primarily work with affiliate marketing, but I’m definitely going to start experimenting with dropshipping next year, because I like the idea of selling products directly. In fact, I have already chosen a niche, purchased a domain name and am ready to get started! It’s taken me a long time to take the plunge, so I’m looking forward to this new adventure. Do you think either one of these business modes is better than the other? If so, why?